Home > Departments > Faculty > Beth Gale Ph.D.
Dr. Gale received a B.A. from the University of Delaware at Newark in 1993, and an M.A. and Ph.D. from the University of Pennsylvania in 1996 and 1999, respectively. 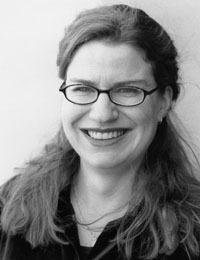 She has been at Clark since 2001 and is affiliated with the program in Women's and Gender Studies. Dr. Gale's main scholarly focus is depictions of female adolescence in the French novel from the late nineteenth and early twentieth centuries. Her research explores such topics as education, the body, family dynamics, friendship and sexuality from a sociohistorical perspective. She has published articles on postcolonial autobiography, coming-of-age narratives, and the problematics of space in the novel of adolescence. Her recent courses include coming of age in the novel and contemporary francophone youth culture as portrayed in literature, film, music, and magazines. "Renée Mauperin as 'Vierge moderne': Documenting Adolescence." Romance Quarterly 53.1 (Winter 2006): pp. 43-6. "Un cadeau d'amour empoisonné: Les paradoxes de l'autobiographie post-coloniale dans L'Amour, la fantasia." Neophilologus Vol. LXXXVI, No. 4, October 2002. Amsterdam: Kluwer Academic Publishers, October 2002. pp 525-536. "Female Adolescent Space(s) According to Rachilde." Romance Notes, Volume IVI, Number 3. The University of North Carolina at Chapel Hill, Spring 2001. pp. 311-318. "Altérité et isolement: l'adolescence chez Alain-Fournier, Colette et Cocteau," Romance Languages Annual (RLA), Vol. XII, 2000, pp. 32-35.